Yaden, D. B., McCall, T. D., & Ellens, J. H. (Eds.). (2015). Being Called: Scientific, Secular, and Sacred Perspectives: Scientific, Secular, and Sacred Perspectives. ABC-CLIO. Yaden, D. B., Kaufman, S. B., Hyde, E., Chirico, A., Gaggioli, A., Zhang, J. W., & Keltner, D. (2018). The development of the Awe Experience Scale (AWE-S): A multifactorial measure for a complex emotion. The journal of positive psychology, 1-15. Yaden, D. B., Eichstaedt, J. C., Kern, M. L., Smith, L. K., Buffone, A., Stillwell, D. J., Kosinski, M., Ungar, L. H., Seligman, M. E. P., & Schwartz, H. A. (2018). The language of religious affiliation: social, emotional, and cognitive differences. Social Psychological and Personality Science, 9(4), 444-452. Yaden, D. B., Haidt, J., Hood Jr, R. W., Vago, D. R., & Newberg, A. B. (2017). The varieties of self-transcendent experience. Review of General Psychology, 21(2), 143-160. Chirico, A., Cipresso, P., Yaden, D. B., Biassoni, F., Riva, G., & Gaggioli, A. (2017). Effectiveness of Immersive Videos in Inducing Awe: An Experimental Study. Scientific Reports, 7. Newberg, A. B., Wintering, N., Yaden, D. B., Zhong, L., Bowen, B., Averick, N., & Monti, D. A. (2017). Effect of a one-week spiritual retreat on dopamine and serotonin transporter binding: a preliminary study. Religion, Brain & Behavior, 1-14. Yaden, D. B., Le Nguyen, K. D., Kern, M. L., Wintering, N. A., Eichstaedt, J. C., Schwartz, H. A., … & Newberg, A. B. (2017). The noetic quality: A multimethod exploratory study. Psychology of Consciousness: Theory, Research, and Practice, 4(1), 54. Wurzman, R., Yaden, D., & Giordano, J. (2016). Neuroscience Fiction as Eidolá: Social Reflection and Neuroethical Obligations in Depictions of Neuroscience in Film. 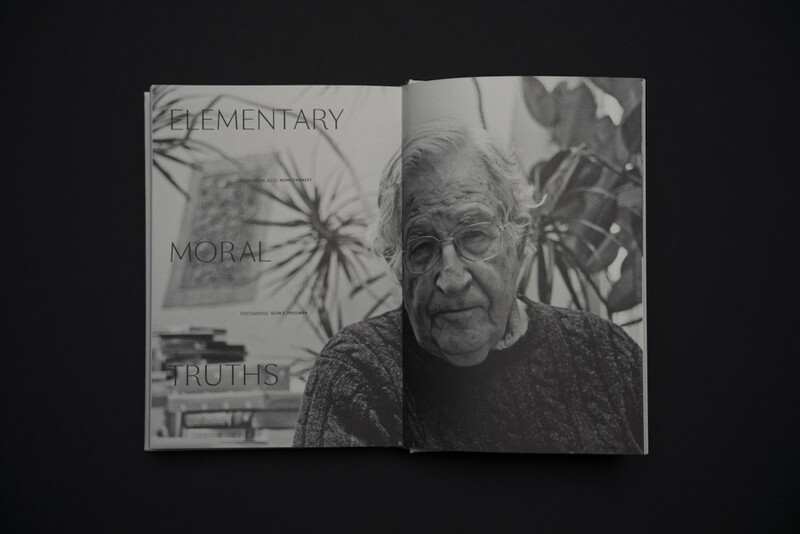 Cambridge Quarterly of Healthcare Ethics, 1-21. Yaden, D, B., Le Nguyen, K. D., Kern, M. L., Belser, A. B., Eichstaedt, J. C., Iwry, J., … & Newberg, A. B. (2016). Of roots and fruits: A comparison of psychedelic and nonpsychedelic mystical experiences. Journal of Humanistic Psychology, 0022167816674625. Park, G., Yaden, D. B., Schwartz, H. A., Kern, M. L., Eichstaedt, J. C., Kosinski, M., … & Seligman, M. E. (2016). Women are Warmer but No Less Assertive than Men: Gender and Language on Facebook. PloS one, 11(5), e0155885. Yaden, D. B., Iwry, J., Slack, K. J., Eichstaedt, J. C., Zhao, Y., Vaillant, G. E., & Newberg, A. B. (2016). The overview effect: Awe and self-transcendent experience in space flight. Psychology of Consciousness: Theory, Research, and Practice, 3(1), 1-11. Yaden, D. B., Eichstaedt, J. C., Schwartz, H. A., Kern, M. L., Le Nguyen, K. D., Wintering, N. A., … & Newberg, A. B. (2016). The language of ineffability: Linguistic analysis of mystical experiences. Psychology of Religion and Spirituality, 8(3), 244. Newberg, A. B., Wintering, N. A., Yaden, D. B., Waldman, M. R., Reddin, J., & Alavi, A. (2015). A case series study of the neurophysiological effects of altered states of mind during intense Islamic prayer. Journal of Physiology-Paris, 109(4), 214-220. Yaden, D. B., Iwry, J., & Newberg, A. B. (2016). 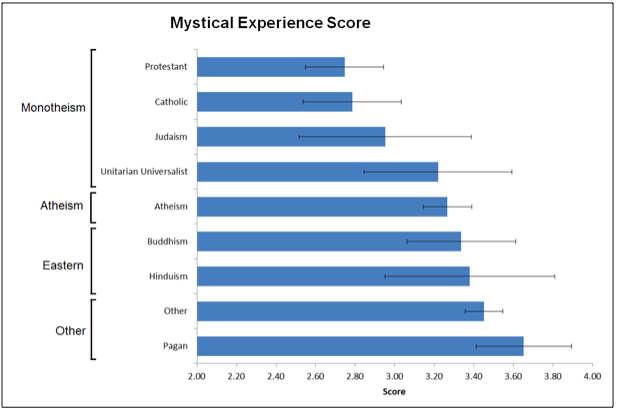 Neuroscience and Religion: Surveying the Field. In Clements (Ed.) MacMillan Interdisciplinary Handbooks on Religion: The Brain, Cognition, and Culture. Yaden, D. B., Iwry, J., Smith, E. E., & Pawelski, J. O. (2017). Secularism and the science of well-being. In Zuckerman, P., & Shook, J. (Eds.) The Oxford Handbook of Secularism. Yaden, D. B., & Newberg, A. B. (2015). Road to Damascus moments: Calling experiences as prospective epiphanies. In Yaden, D. B., McCall, T., & Ellens, J. H. (Eds.). Being Called: Secular, Scientific, and Sacred Perspectives. Westport, CT: Praeger. Yaden, D. B., Anderson, D. A., Mattar, M., & Newberg, A. B. (2015). 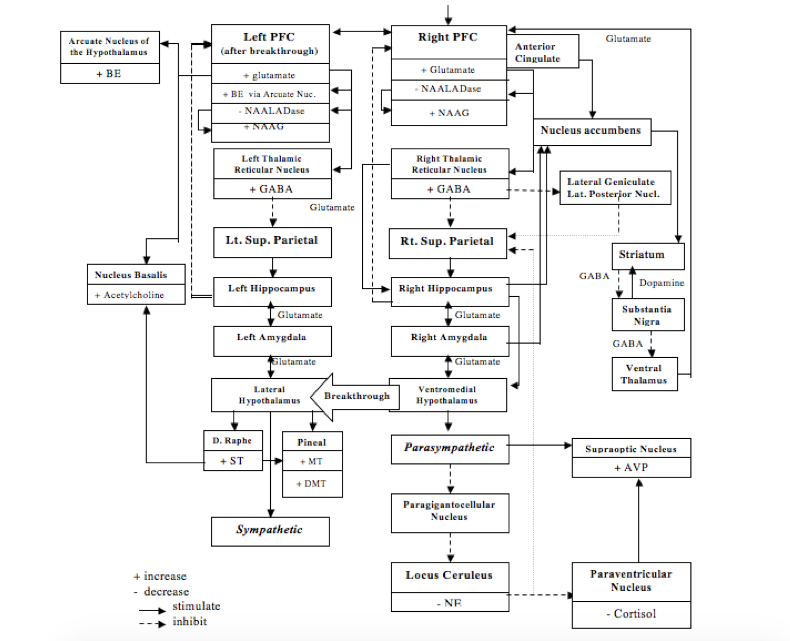 Psychoactive stimulation and psychoactive substances: Ethical and conceptual considerations. In J. H. Ellens & T. J. Roberts (Eds.) Psychedelic Policy Quagmire: Health, Law, Freedom, and Society. Westport, CT: Praeger. Yaden, D. B., & Newberg, A. B. (2014). A new means for perennial ends: Self-transcendent experiences & direct neural stimulation. In J. H. Ellens (Ed. 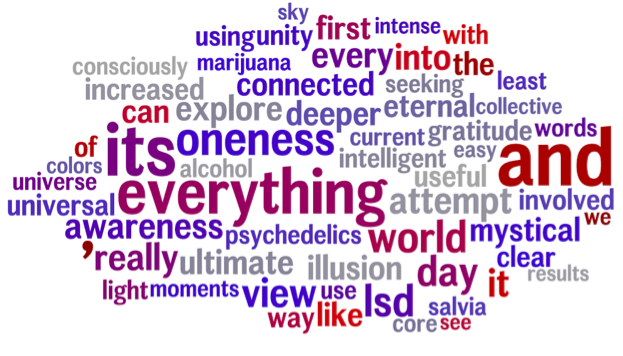 ), Seeking the Sacred with Psychoactive Substances. Westport, CT: Praeger. Constantinou, T., O’brien, P., & Yaden, D. B. (Eds.) (2013). Genesis. Reykjavik, Iceland: Paradigm Publishing. Yaden, D. B. (2015). The future of spirituality. 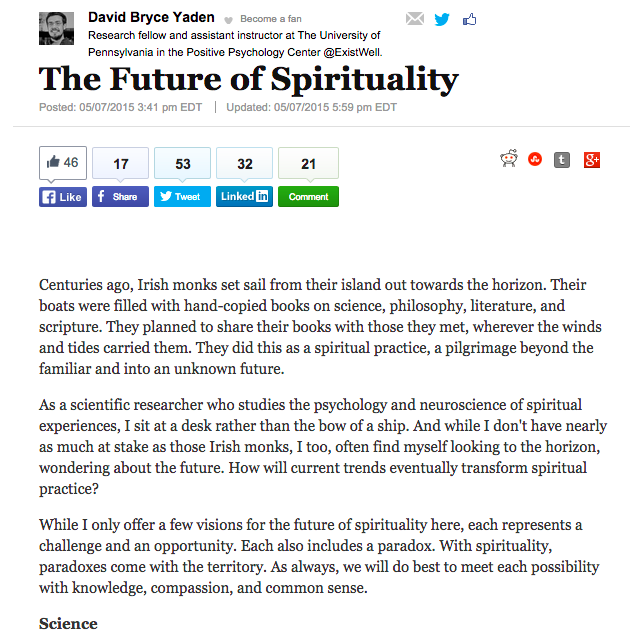 http://www.huffingtonpost.com/david-bryce-yaden/the-future-of-spirituality_b_7235490.html, Huffington Post. Research [ http://www.bioinnovationethics.com/brain-stimulation.html ], The Academy of Medical Ethics and Bio-Innovation. Yaden, D. B. (2014). In ‘E Pluribus Unum’ We Trust: Congressional Concerns, Positive Psych, & Our Nation’s Motto [ http://appliedsentience.com/2014/02/21/in-e-pluribus-unum-we-trust-a-positive-psychologists-take-our-national-anthem/#more-1282 ], Applied Sentience. Yaden, D. B. (2014). “Our Modern Mysticism”. In Constantinou, T., O’brien, P. & Yaden, D. B. (Eds.). Genesis. Reykjavik, Iceland: Paradigm Publishing.